"Sampath Speaking" - the thoughts of an Insurer from Thiruvallikkeni: ghost of Chris Broad haunts Ben Stokes ~ DDR master stroke ! ghost of Chris Broad haunts Ben Stokes ~ DDR master stroke ! Sunday, much hyped World T20 finals 2016 – England once pushed to corner could muster and set up a target of 155. 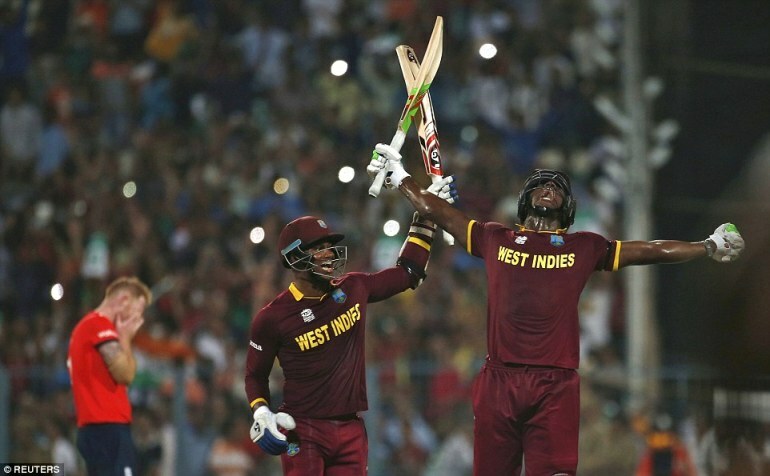 Ordinary mortals talked about Chris Gayle and the new found hero Lendl Simmons. After the 1st over, WI were 1/0 – Eoin Morgan made a gamble, Joe Root, the bowler (I have not seen him bowl earlier !) and his first ball got Charles out. In strode, Marlon Samuels, the champion of the WC finals in 2012. Of the 3rd ball, he struck again, Gayle slogged high and straight to long off. In the next over Lendl Simmons was lbw to Willey for a duck .. and with that hopes of WI vanished !! or so one thought. Real fans never lose hope – as we sat to see the match till its end – after 17 WI were 118/6 – 38 required off 18 and it was only wishful thinking of any miracle happening .. Marlon was still there and had been joined by a player who had been recently bought by DDR. In the end, England Captain Eoin Morgan was left to lament the “cruel" nature of cricket after England, and Ben Stokes, were left broken. Stokes has been a rock for his country in the tournament, repeatedly sticking his hand up for the chaotic death overs, but he was left in a heap at Eden Gardens after being blitzed. The GMR group has Paddu Upton, Pravin Amre, Thirumalai Ananthanpillai Sekar, Rahul Dravid, Sunil Valson (remember he was part of 1983 WC) – and the franchisee, Delhi Daredevils chased in action this young WI for a whopping Rs. 4.2 crore, from a base price of Rs. 30 lakh. Calypso was a nymph in Greek mythology, who lived on the island of Ogygia, where she detained Odysseus for several years. WI are known as calypso kings. In 1970s and 1980s when WI ruled the Cricket World, remember one tour by England to the West Indies. They were battered to pieces by the relentless pace attack of the islanders and slaughtered in the Tests. Holding, Roberts, Daniel and Croft rotated over and over and poor old Mike Gatting had his nose smashed by a wicked piece of chin music. So bad was the damage that they found bits of bone embedded in the ball. It was savage and beastly. The story goes that in the middle of the Test series, the Poms had a break to gather themselves with an easy match against the Emerging West Indies and in this they faced four youngsters called Malcolm Marshall, Curtley Ambrose, Courtney Walsh and Patrick Patterson and they were battered again, even more so. They limped onto the plane after the tour and everyone wondered how the West Indies would ever lose a series again. Things changed so badly for the island Nations – now when Test matches happen, it is more often a Q of how much is going to be losing margin !!! At Eden Gardens, yesterday, the DJ had turned on the Calypso. ‘Champions, champions’ blared out of the sound system. Set 149 to win, the Windies cruised to victory with eight wickets in hand and three balls to spare thanks to a 120-run opening stand between captain Stafanie Taylor (59 off 57) and 18-year-old Hayley Matthews (66 off 45). The West Indies women began the merry dance. Stafanie Taylor, Hayley Matthews and Deandra Dottin all celebrated joyously. The Caribbean women had earned every bit of it, after their convincing eight-wicket win over Australia in the women’s World T20 final. The West Indies captain was named the Player of the Tournament for her 246 runs and eight wickets. The inspiration had been sown a couple of months ago at Mirpur. Keacy Carty and Keemo Paul batted for 20.3 overs to wipe out the 69 remaining runs needed to win their first Under-19 World Cup title. As West Indies drew closer to winning their first Under-19 World Cup, Gidron Pope came rushing out of the dressing room towards the team dugout and saw all his team-mates sitting down. They needed nine from the last two overs and he knew they were going to win. Pope got everyone on his feet. The players, the head coach, the physio, the bowling coach, the team manager - all of them formed a line with arms around each other just beyond the boundary line, ready to burst on to the field as soon as the winning runs were struck. They cheered when Keacy Carty reached his half-century in the penultimate over, and took off when Keemo Paul sent a top-edge flying over the wicketkeeper. In the finals that every one saw - Chris Jordan has had a great tournament with his yorkers. He has a wet ball in his hand. England have 27 to defend. Jordan bowls an ordinary first ball, which goes for four, but comes back superbly, conceding just singles off the next four balls. For West Indies' sake, they need a boundary off the last ball because they don't want to find themselves needing three sixes off the last over. Marlon Samuels, 85 off 65, is on strike. He has been brutal on everything that has been not a yorker of late. Jordan - 3.5-0-36-0 - has to secure this match for his team right now. He runs in, Samuels backs away as he always does to open up the off side, and Jordan slips in a wide yorker. A dot ball…. It boiled to 19 off the last – near impossible. Ben Stokes to bowl it, a young player gaining a reputation as a reliable “death” bowler. There is a story of a footballer waiting to take a late decisive penalty in a vital match. “ I wouldn’t like to be in his boots now,” said the commentator. ” There is little love lost between Stokes and Samuels – except that in that final over at Eden Gardens he did not get the opportunity to bowl to him, faced instead by Carlos Brathwaite, a tall muscular Barbadian, with long levers and a keen eye. Stokes searched for his yorker, angled in at the batsman’s feet, but was short by a foot or two, so that Brathwaite could swing himself off his feet in depositing it over backward square leg for six. Stokes adjusted his line but not the length sufficiently, so that the second ball was muscled over long-on for a second six. Suddenly from facing defeat West Indies were in the driving seat. Still seven runs were needed from four balls. Brathwaite swung again, enough almost to put himself in traction as a consequence, and without quite connecting properly, sent the third delivery for another six, over long-off. Scores level and game almost over. Brathwaite, adrenaline pumping, was not going to let up now. A fourth six soared over wide long-on and the field was overwhelmed by a tidal wave of West Indian cricketers and staff, male and female, for West Indies women’s team had taken their version of the competition earlier in the day, and the elaborate orchestrated celebrations began. Stokes was obviously and understandably distraught, a red-faced misty-eyed firebrand down on his haunches with his head in his hands as Chris Jordan tried to console him. Virat Kohli was deemed man of the tournament. ..and Marlon spoke off Warne. There is history between Shane Warne and Samuels. During a BBL match in January 2013, Samuels seemed to have grabbed Warne's Melbourne Stars team-mate David Hussey as he turned for a second run. Warne indulged in some shirt pulling when Samuels came out to bat. Then a Warne throw from close range whizzed by Samuels's face after which Samuels threw away his bat in anger. Warne the commentator has also not been very complimentary of Samuels, who doesn't like it. When accepting his Man of the Match award, Samuels said he had only Warne on his mind when he woke up, and - following criticism of his dismissal against India in the semi-final - that he knew he would turn up for the final. Then he displayed his trophy to the cameras and said, "This is for Shane Warne." At the press conference he laid into Warne some more. "Every team I play for, Shane Warne has a problem with me," Samuels said. "I don't know what, I've never disrespected him, it seems he has a lot inside him that he needs to come out with. I don't appreciate the way that he continues to talk about me, and the things he keeps doing. I don't know, maybe it is because my face is real and his face is not."